Kids love to get down and dirty, it’s in their nature! And what better place for them to do it than in the great outdoors, a safe distance from the clean floors and upholstered furniture of your house. Mud kitchens have exploded in popularity in recent years. Guaranteed to keep children occupied for hours, mud play is also hugely beneficial for their cognitive development and fine motor skills. In fact, many nurseries and pre-schools now use purpose built mud play areas and mud kitchens as part of their learning curriculums. 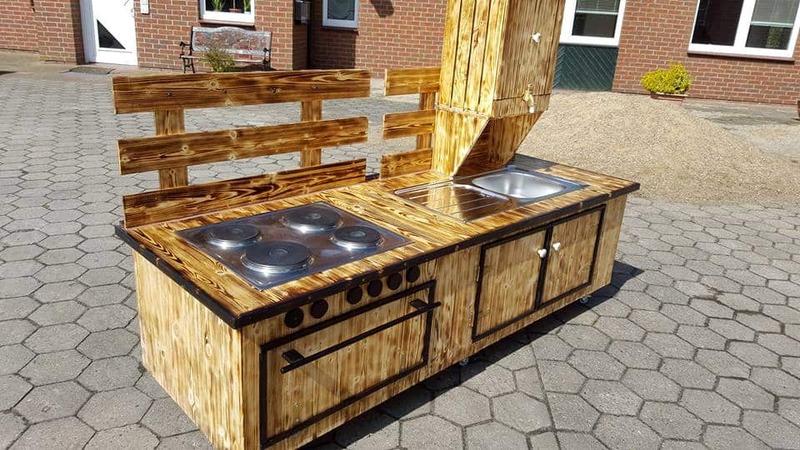 This stunning Mud Kitchen by Plum® has built in planters, a bamboo wind chime and even a screen for painting! Check it out in more detail! What Are the Benefits of Mud Play? It’s just a bit of dirt, right? Wrong! The notion of getting plastered in mud delights most kids and horrifies most parents, but the truth is that it is mutually beneficial to both. As a social tool, it encourages open ended play and communication, thus developing a child’s self-esteem. 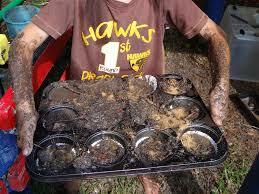 Mud play is considered a sensory activity. 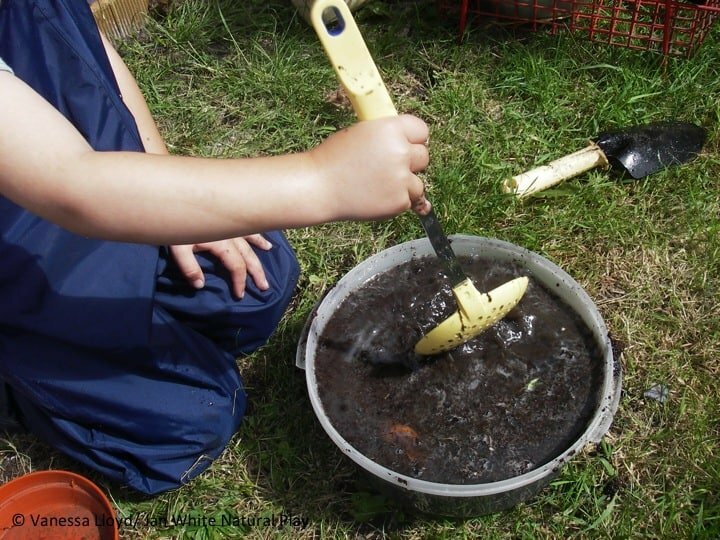 For children, the sensation of squashing the mud through their fists and working it into moulds and shapes helps to build important nerve connections in the brain. Not only that, but it also stimulates creativity and imagination, providing an enriching learning environment for practising role play. On top of this, it offers the perfect opportunity to connect with the natural world and learn through exploring and experimenting with garden flora and fauna. Young children are keen learners who tend to gravitate naturally towards educational activities that mature their brain development. Kitchen settings are ideal for improving cognitive skills across a broad spectrum, so it’s no surprise that they are one of the most popular toys in the 3-8 age bracket. Kids love to imitate adults, and so the role play aspect of a kitchen alone is enough to spur their interests. Basic mathematical reasoning is advanced through measuring, counting and weighing ‘ingredients’. Fundamental scientific investigation is offered through mixing different substances with the mud to change its consistency. 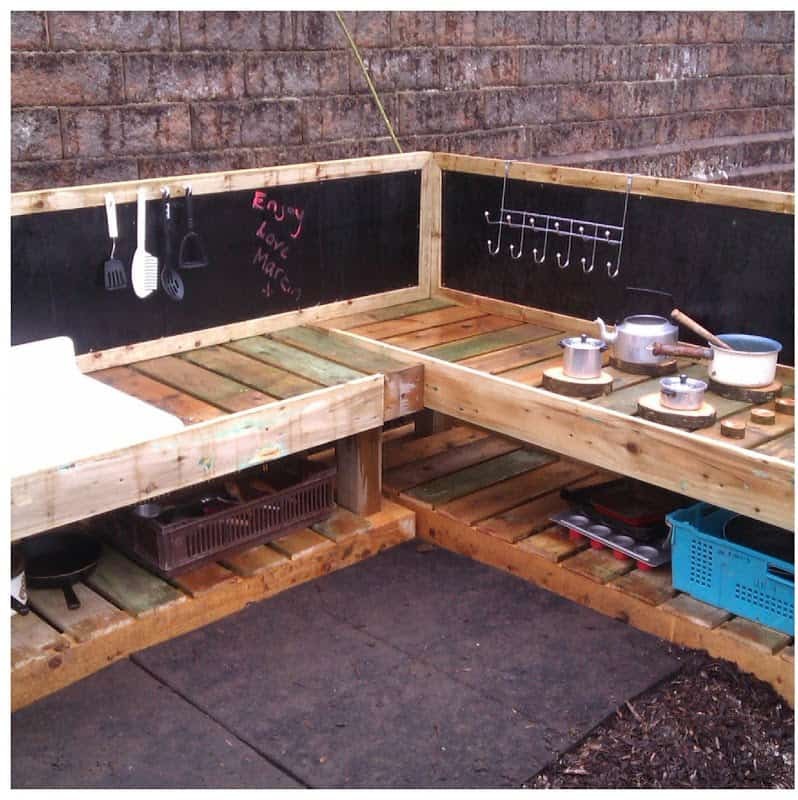 Of course, infants and toddlers won’t fully comprehend of what they are doing but rest assured, with a mud kitchen they will be learning continuously through the medium of play. In the last few decades, childhood has been reinvented from a mostly outdoor lifestyle to an indoor one. Where kids once spent most of their time outside in the open air, they now prefer to stay indoors, tied to electronic devices. As well as this, society has become more focussed on sanitation and cleanliness, causing people to wrongly believe that a sterile environment is best for young kids. However, the opposite is true, and recently there has been a growing movement advocating for a return to the more traditional way of life. implications, but the science speaks for itself. Research conducted in the last few years has shown that bacteria on the surface of the skin can be beneficial, and exposure during early childhood primes the immune system and can minimise the chances of developing allergies. 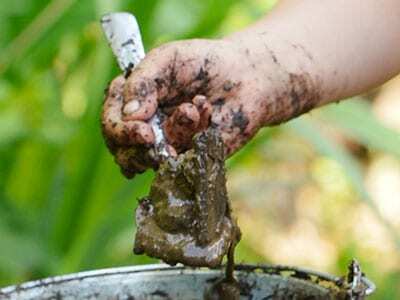 Studies have also revealed that playing with mud releases microscopic bacteria called Mycobacterium Vaccae which in turn stimulate the immune system and increase serotonin production. 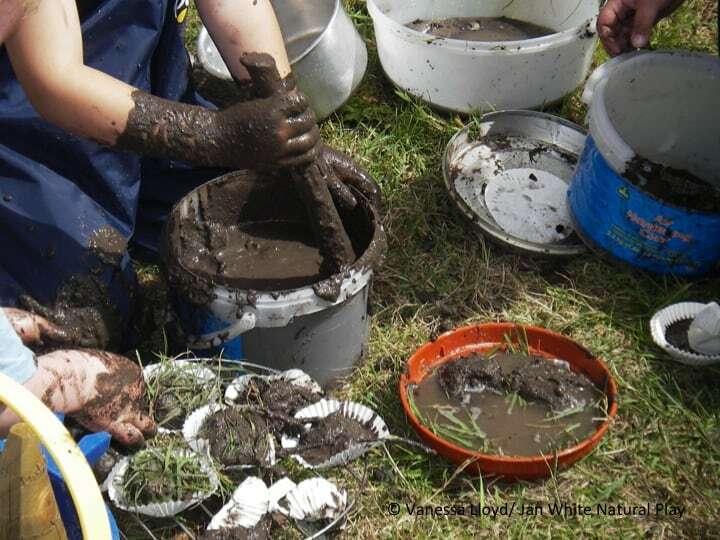 So not only does mud play encourage development on an educational, creative and social level, it also soothes and calms. Amazing, isn’t it? Ok, I’m Sold! Where Do I Start? The great thing about mud kitchens is that you can start as small as you like. 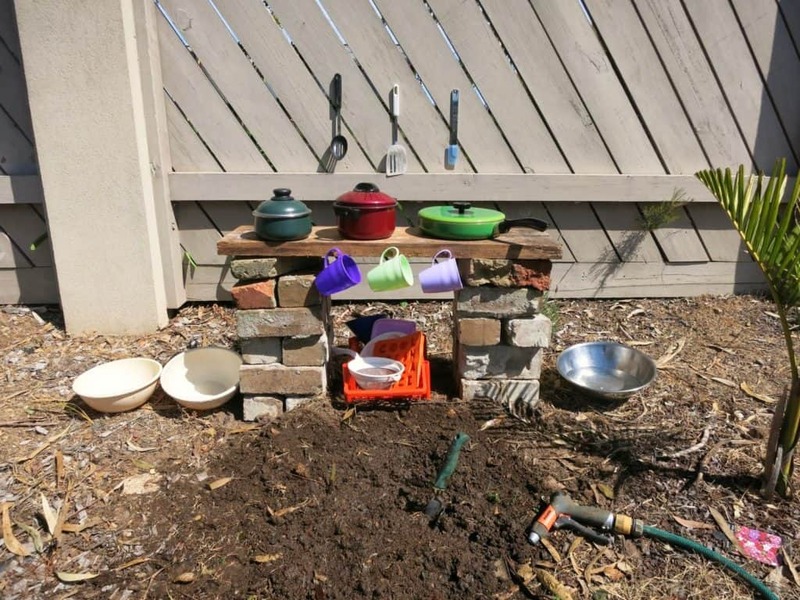 On the simplest level, you can let the kids loose in the garden with some disused kitchen utensils and pots and see what culinary masterpieces they come up with. This is a great way to test their initial interest before committing yourself to a bigger project. The beauty of outdoor play areas like mud kitchens is that they don’t have to be perfect or pristine. After all, they are only going to get rained on and covered in dirt anyway. Once they don’t pose any hazard and are safe for children to use, they are fine. Once you have determined that your kids are up for some mess making (and believe me, they will be! ), you might want to offer them a more permanent garden fixture. Any old furniture that provides a work surface will do: neglected dressers, desks and tables are ideal and offer a low cost, no-fuss option. 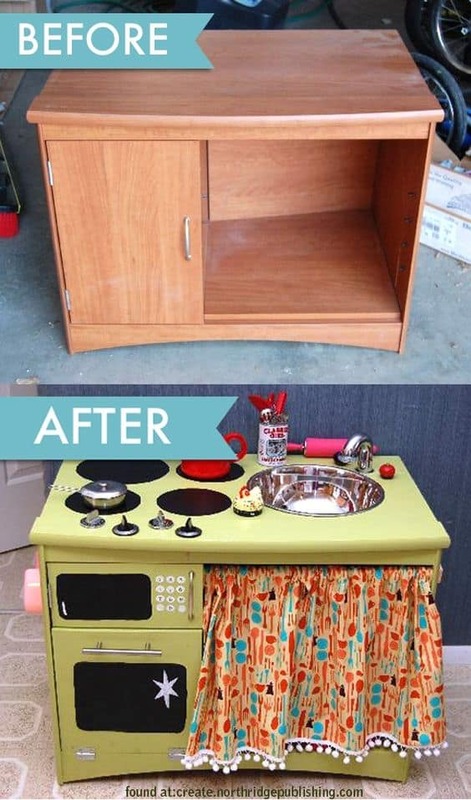 Repurposing will also save you a potential trip to the rubbish tip! 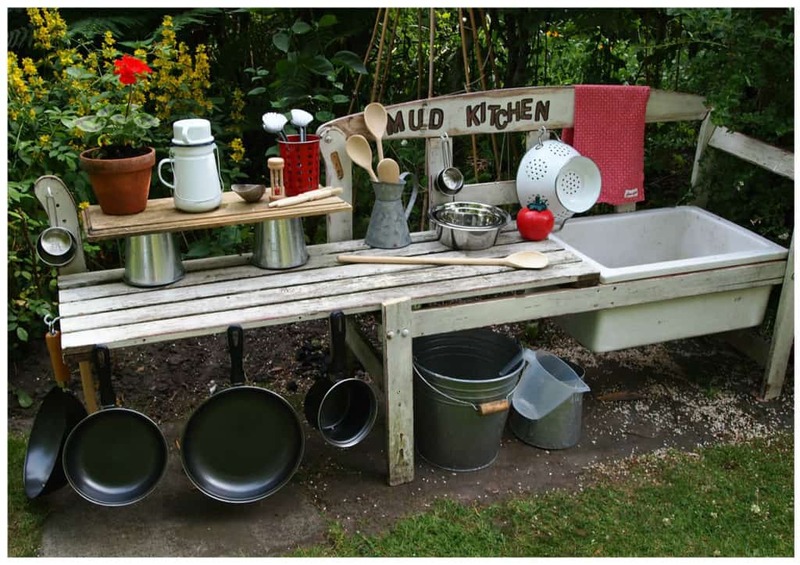 You will need some utensils and a few basins for the kids to work with but basically, any old crockery and kitchen tools cluttering up your house can be rehomed in the mud kitchen. If using discarded furniture, it’s important to ensure that the item is sturdy and safe for use. Double check that taller objects aren’t toppling hazards. Bear in mind that your mud kitchen will be exposed to the elements so you may want to dig a trench to give added support to larger pieces. 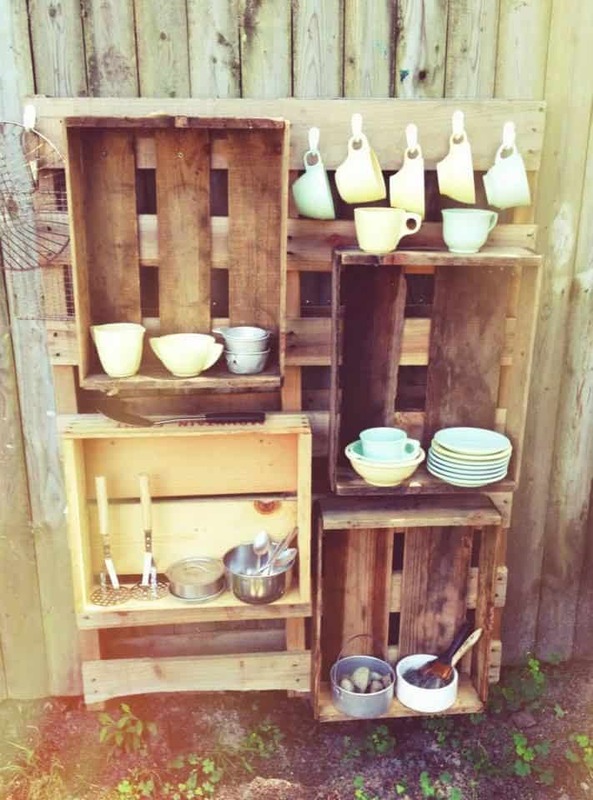 There are a few inexpensive ways to give a wow factor to your upcycled mud kitchen. A simple coat of paint will give it a facelift. Indulge your inner child and select some bright striking colours! Painting is also the perfect opportunity to blend your mud kitchen in as a garden feature, rather than just the kids’ corner of the garden. To ensure your old furniture withstands the weather outdoors, you may want to use some heavy duty outdoor primer first. Another cheap decorative option is to buy some vibrant coloured trimmings to add to your kitchen. Hooks, knobs and storage boxes can all be bought for next to nothing in hardware stores and are handy for keeping all your bits and pieces together. The kids will love getting involved and helping you at the decoration stage, so make sure and involve them in your decisions! 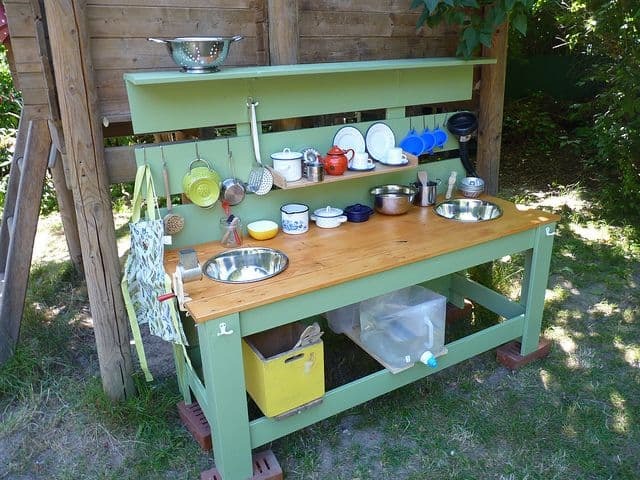 If you know your way around a toolbox, you may prefer to build your mud kitchen from scratch. Planning is the key, draw up your design carefully and make sure that your measurements are correct before beginning. One of the advantages of designing it yourself is that you always have the option of extending and adding more to your kitchen down the line. Your kitchen can be as basic or as state-of-the-art as you like. If you’re stuck for time or space, a few pallets attached to a wall or fence will provide the necessary workspace for your kids to embark on their gastronomic adventures. 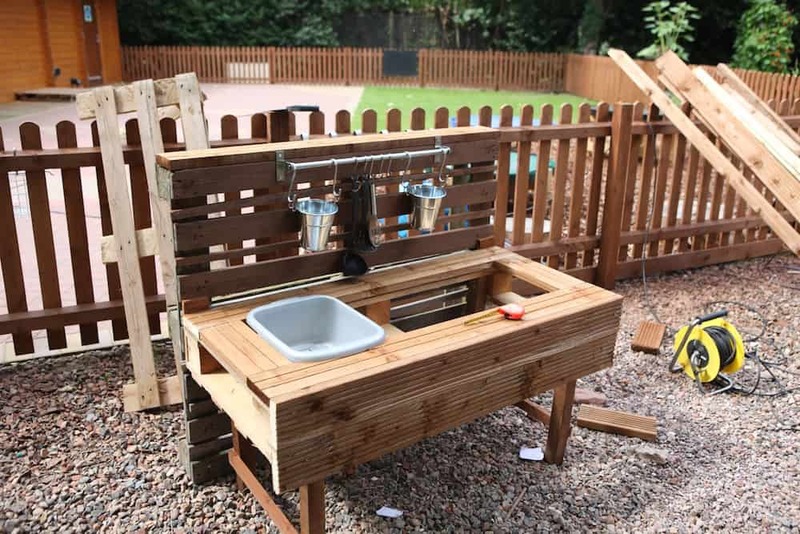 As in real-life, the sky is the limit when it comes to kitchen design and if you have the time, skill and budget, you can create a mud kitchen fit for a budding Michelin star chef. Fully functional sinks, authentic hobs, chrome accessories: the choice is yours! Whether you opt for a simple or more intricate model, it’s worth bearing in mind that at the end of the day it will be kids who are using it. A perfect replica of your oak stained shaker-style kitchen may look pretty in the garden but let’s face it, a few splashes of colour and interesting features will make it infinitely more appealing to a child. So, you’ve decided that you want to construct your own but you have no idea where to begin? Here’s a step-by-step guide to help you on your way! Get your thinking cap on! As always, it is vital to think your project through and draw up comprehensive plans before beginning. Depending on where the kitchen will be located, you may prefer to build a galley style length of units, or you might opt for an L shaped unit. Material-wise, pallet mud kitchens are a cheap option, but rather than going to the hassle of disassembling the pallets and reassembling them to create the frame you have in mind, it might just be easier to buy lengths of wood. Some 2x4s and 1x6s will do. You will also need to buy a simple stainless steel sink. Start building! You are aiming for basic side tables. Make as many as you need and fit them together in your desired configuration. For the main kitchen section, you will need to leave a hole to fit your sink or basin in. 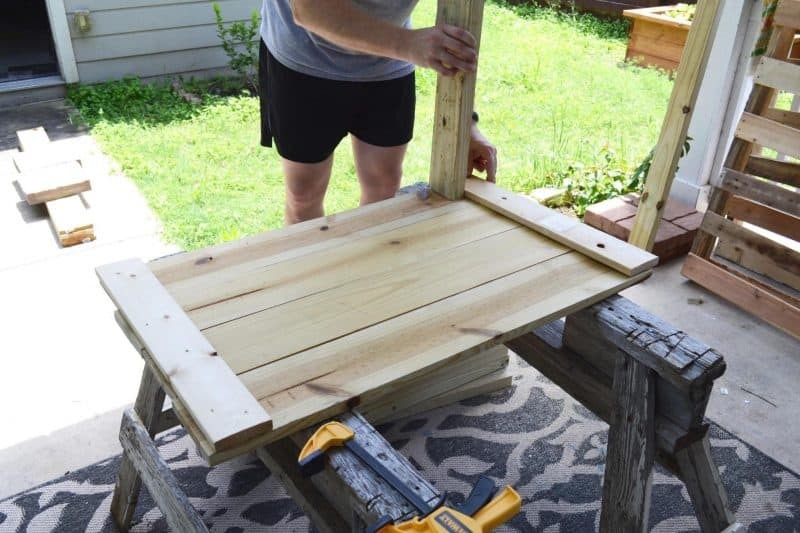 The 1x6s will create the table tops and the 2x4s will fashion the legs. If you want to add a simple splashback, attaching a few pallets to the back of your tables is a quick and easy solution. Accessorize! Utensil racks, hooks, baskets, drawers, go wild! If you’re on a tight budget, pound shops and thrift stores are a great place to find cheap and cheerful kitchen utensils that will suffice for mud pie making. Obviously, with a mud kitchen the fun is in the filth, so you’re never going to have spotless kids after a session (when are kids ever spotless anyway?) However, there are a few ways to minimize the mess and make the clean-up operation run a lot smoother. A garden hose is handy for washing down your mud kitchen unit after a productive cooking session. The old-fashioned method of throwing buckets of water over it will also suffice. Your children will be more than happy to help too! Protective clothing. It’s not going to keep all the dirt at bay but it will go a long way to ensuring you don’t have to scrape your kids clothes off before putting them in the washing machine. Plastic aprons are a good option, but for the ultimate protection, a puddlesuit will do a brilliant job. These have the added benefit of being weatherproof so your little one can go baking even when it’s pouring rain out. They can also be hosed down gently for easy cleaning. Don’t forget the wellies! 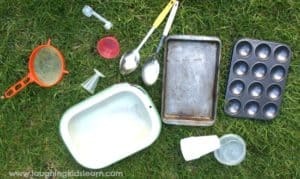 Which Utensils Do I Need for My Mud Kitchen? knife probably isn’t the best accessory for kids to play with, even if it is blunt. Before you bring any new utensil to the mud kitchen, you should inspect it and have a quick think about any potential hazard it might pose. You’d be surprised at how a child can turn the most benign object into a weapon! Pound shops and home furnishing stores are the perfect place to stock up on kitchen paraphernalia. Baking instruments such as wooden spoons, spatulas, baking moulds and cupcake trays are perfect for mud pie construction. Large handled tools like ladles and slotted spoons are also excellent for small hands to get to grips with. Pots, pans and basins make great mixing bowls. If you are feeling more adventurous, a funnel and rubber tubing are great for scientific exploration and water play. A collection of large plastic jars is handy for storing all your gathered ingredients such as pine cones, pebbles, twigs and other pantry staples. Why not bring the kids on weekly foraging expeditions to discover new and interesting ingredients? 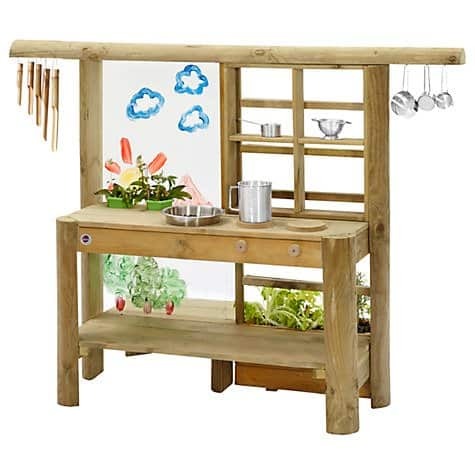 Wooden play food is a nice addition that will add a more authentic touch to your garden kitchen. Durable and sturdy, you can buy a whole range of wooden fruit, vegetables and pantry foods that your kids will love. 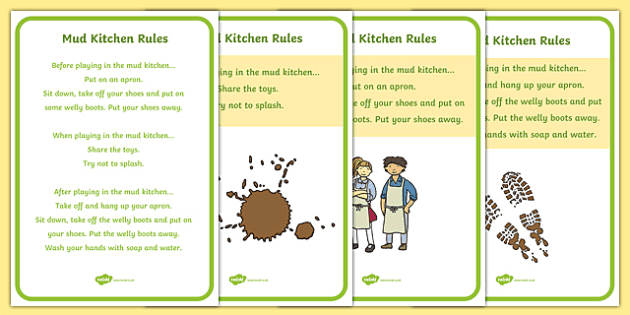 Mud kitchen recipe cards can be downloaded online and are excellent for younger children as they give a pictorial guide. If your kids are of reading age, you might prefer to just write your own and print them out. Recipe template sheets can also be found here. The kitchen is open for orders, let the fun begin! Mud kitchens are brilliant for cooking up all sorts of varied dishes. 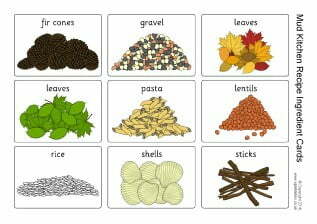 Dried pasta, wildflowers, seashells, seeds and pebbles are all vital ingredients so keep a good stock on hand. Oh, and of course water. Why not pull up your set of patio furniture and play restaurant? Put your feet up and relax, safe in the knowledge that dinner is taken care of. What could be more appetizing than a mud stew, complete with granite dumplings and a side of twig fries? Get the kids to plan their service by drawing up a menu and following their recipes. Melamine picnic dinnerware are the ideal accessories for your outdoor café. 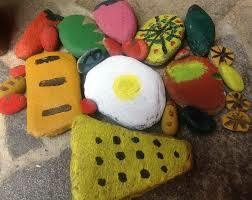 Painted pebble food is a wonderful craft project to add a new dimension to your kitchen. Get the kids to collect medium sized pebbles and spend an afternoon painting them up into fruit, vegetables and foodstuffs of your choice. Muddy gelato is another fun game. The kids will love scooping the mud up and making cones. Mud baking has always been a firm favourite. From cupcakes to pies to complicated double layered party cakes, your kids will have a ball pretending to be contestants on the Great British Bakeoff. Baking utensils such as rolling pins, moulds and spatulas can all be purchased cheaply online or in home stores. Junior Mud Masterchef. Who will wow the judges with their unique and inventive culinary creations? If your kids are older, you can incorporate simple lessons into their kitchen activities. Buy an inexpensive manual timer and set them goals to perform within a set timeframe. Or draw up a list of instructions and get them to follow. Write them some rules and watch as they figure out how to complete tasks step-by-step. Mud Kitchen Recipe Books! Get the kids all psyched up by writing their own recipe books. Templates can be downloaded online, although a little scrapbook might be better as you can take photos of their creations to stick in after the recipe has been perfected. While it is good to have some set activity ideas to counteract the claims of boredom, try not to be too structured. 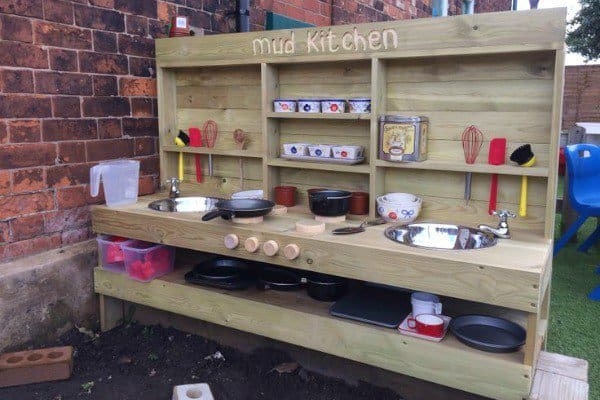 Mud kitchens are brilliant for many things such as role playing situations, social interaction and improving memory and cognitive abilities, but above all else they are an excellent base for free play and creative expression. So just relax and let your children set the rules. For once, it doesn’t matter if the whole thing descends into mud-slinging chaos. You never know, you might just find yourself joining in!